The Comar 7P.i. ECO door has been designed to provide high performance solutions for today’s specification demands. Utilising Comar’s trademark P.i. (Polyamide Insulation) thermal break technology, it delivers superior thermal performance with an aesthetic edge. 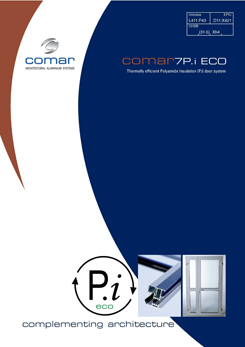 Aesthetics come from its slim 55mm profiles, seamlessly integrating with the Comar 5P.i. ECO casement window system. providing excellent weather-proofing. This ensures that, even in the most extreme locations, the Comar 7P.i. ECO doors maintain their high performance. Security concerns are alleviated with the Comar 7P.i. ECO door exceeding the requirements of PAS 24 (Enhanced Security Performance for Door Assemblies) with its Secured by Design multi-point locking system and key cylinder that is both anti-bump and anti-snap, ensuring the highest levels of reassurance against intruder attack. Comar 7P.i. ECO comes with various threshold options, such as rebated for weather performance or low-rise for compliance with the Disability Discrimination Act (D.D.A).